"Kami po ay medyo nababahala kasi nakikita naman natin kung gaano 'yung insistence ni Secretary De Lima atsaka ni Chairman Brillantes na ang dating pangulo po ay ilagay sa isang government hospital," she added. 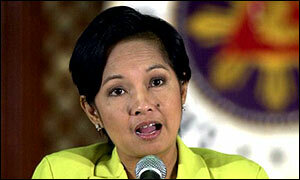 Arroyo's camp supposedly received the information from a government official a few days ago, according to Horn. Yan ang Pinoy. Focused on the trivial and the irrelevant. Perhaps there are people who may want to see Arroyo dead. But then we're talking about a nation of people renowned for holding grudges for entire lifetimes. So no surprises there.